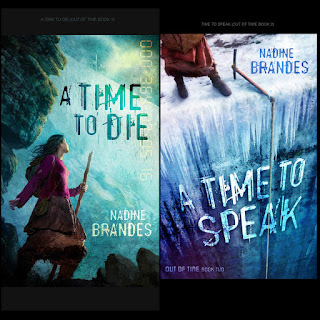 Nadine’s debut, A Time to Die, won the ACFW Genesis Award in 2015. In a dystopian world, where everyone in the USE (United States of the East) is required to have a clock from birth that accurately counts down to their death date, Parvin has a year and a half to live. She decides to spend the last of her days trying to rescue Radicals (people who either destroy their own clocks or lose theirs) from the government. The government finds out about her illegal activities and casts her through the Wall, essentially a death sentence. No one who goes on the other side ever returns. She discovers things that may impact the world and save Radicals. But her clock is running out. Both of these are phenomenal. Her writing is vivid and absolutely beautiful. And it has a romance thread! Parvin is very relatable, yet you have to admire her for her courage and selflessness (especially in the second book). I love both Jude and Hawke (which is an incredibly cool last name). Hawke is so noble and heroic. Anyways, I really love him. The story world is also amazing. The setting is dystopian, though she goes to other places, and each place is incredibly unique, different, and beautiful in its own way. I cried at the ends of both books. There will be people that die (she doesn’t seem to have an aversion to avoiding death ;) ), so if you’re a bit emotionally tender (such as myself) you might want to consider this before reading, because you will absolutely get attached to the characters. The theme of the book is amazing, empowering, and very impactful. All in all, I would recommend this to anyone who loves great literature and has emotional stamina ;) Despite the emotional parts for me, I really, really did love it. I’ve heard that book three is being worked on, and I can’t wait to check it out. If you read it, please tell me how you liked it. I'd love to hear from you! I first heard of this series when I was at Realm Makers last year, and I heard Nadine talking about it. It's on my "to read" list, but I often hold off on reading book series until they are complete, unless I know they don't end on a cliffhanger. I did read the sample of the first book though, and thought it looked intriguing. Do these two books have cliffhanger endings? Thanks, Elizabeth! My kiddos get mad when I cry at books, but they sound amazing! I just read A Time to Die, and I too loved the message of the story! I also thought the Clocks made for an interesting twist on the dystopian genre. Yes, these sound quite good! Great review and I love how you add your own personal preferences as well!